With the festive season officially in full swing, now’s the time to give your beauty routine a little helping hand. If all those holiday parties or looming end-of-year deadlines have left you looking a little worse for wear – or in dire need of a good night’s sleep – an eye mask just might be the answer you’re looking for. The delicate eye area is the first to give away signs of stress, lack of sleep, and dehydration because the skin around our eyes is much thinner than that on the rest of our face. It also contains less oil glands, which in turn means less moisture and the onslaught of fine lines, creases, dark circles, and puffy undereye bags. Not ideal. Enter: the eye mask, a fast and simple way to revive the area and leave you looking refreshed, no matter how you feel on the inside. This product promises to do everything from soothing and smoothing the eye area to diminishing dryness and reducing puffiness and dark circles, all while loading up on anti-aging ingredients. It’s no wonder that some of the biggest celebrities – Kim Kardashian, Jessica Alba, and Rosie Huntington-Whiteley included – are constantly posting selfies with eye masks plastered on to make their love well-known. What’s even better is they couldn’t be easier to use – most take under 20 minutes to work and simply involve popping a patch under the eyes to load them up with nourishment. So skip the cold teabags and cucumber slices, and pick one of these peeper-perfecting eye masks instead. Ellie Goulding has made no secret of her love for these innovative eye masks, and it’s not hard to see why. Their thin, gel-like texture feels like a ‘second skin’ and loads the eye area with a whole host of ingredients, including hyaluronic acid for intense hydration, arnica extract to diminish dark circles and undereye bags, and anti-inflammatory dragon’s blood extract to soothe, protect, and de-puff. This cult favorite is full of anti-aging retinol and plumping collagen to leave the eye area looking rejuvenated and refreshed. It’s also packed full of Mother Nature’s best: grapeseed oil, licorice root, aloe, and rosemary extracts to improve texture, stimulate blood flow, and reduce swelling and dark circles in a flash – not forgetting that super cute shooting star shape for a festive feel. 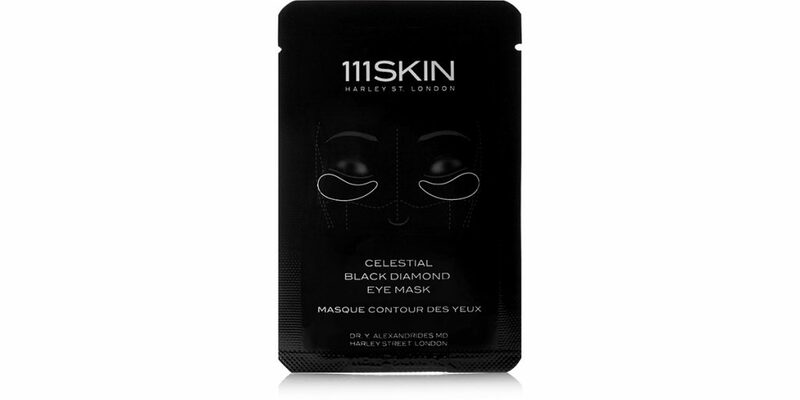 This lifting lace mask is just the ticket to leave you looking bright-eyed and beautiful. Featuring fine lace coated in a slow-release gel concentrate, it contains a plumping and brightening blend of collagen, hyaluronic acid, green tea, and Korean mugwort to reduce the appearance of fine lines and wrinkles. It’s officially time to lace up. The go-to peeper perfecter of Victoria’s Secret Angel Josephine Skriver, 111Skin’s eye mask contains an array of potent anti-aging ingredients to restore youth to the eye area. There’s niacinamide to reduce discoloration, peptide-rich argireline to diminish the appearance of fine lines, and the brand’s signature ‘Hyrdogel Technology’ to boost skin’s moisture absorption. Oh, and not forgetting actual black-diamond particles that penetrate deep into skin to deliver serious results. If a long day has left you – and your eyes – looking tired and dull, then reach for Estée Lauder’s pick-me-up pads. Infused with the brand’s best-selling ‘Advanced Night Repair’ technology (nine bottles of the serum are sold globally every minute, it’s that good), they deliver soothing, hydrating, and repairing ingredients and work in as little as ten minutes to transform the eye area. The secret to faking eight hours of sleep in a matter of minutes, these cooling gel masks harness the power of mineral-rich Icelandic glacial water, Arctic super fruits, gingko biloba, and pure molecular oxygen to tone, firm, and de-puff eyes without a chemical or nasty ingredient in sight. Kate Hudson’s awards-season staple, this golden mask energizes the eye area thanks to a powerful blend of botanicals extracts. Boasting 87 percent natural ingredients and a base of pure rosewater, it features seaweed and plankton extract to smooth and lift, ProVitamin B5 to restore moisture levels, and a unique antioxidant-rich gold and silk serum to soothe and protect. If Hudson’s youthful glow is anything to go by, we’d say they’re well worth the price tag.